Prayer has always been a pillar of Christian faith. The power of prayer is proven to have healing qualities, both emotionally and physically. Prayer is an important part of our worship services, fellowship groups and our daily lives. Many prayers have been answered, and miracles have occurred within our congregation, thanks be to the Lord Jesus Christ. Sunday School classes are offered for all age groups. 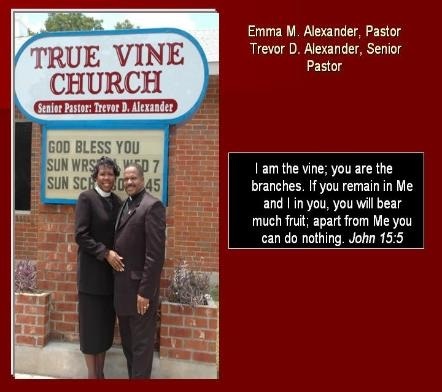 In addition to children’s Sunday School classes, True Vine offers several adult classes. Sunday School is held Sunday mornings from 9:30 – 10:45 am. Bible Study happens here at True Vine on several different aspects. You can be involved in Bible Study in one of our Joshua’s Army Cell Groups, or in our Leadership Academy, or in our Sunday School Classes. We teachers tackle difficult theological subjects and try to interpret and apply the subject matter to our lives. Studying scriptures in a group gives people the opportunity to discuss the meaning of God’s word and to share ideas on living out the gospel.